We enjoy with artificial: jigging, bait cast and spinning. Increases and decreases, so the route that goes from the cosmopolitan and thriving San Pablo to Iguape on the Brazilian Atlantic. They are three hours – more than 200 km – by the picturesque BR-116 to the Southwest, to Oliveira Barros, and thence by the SP-222 South to Iguape. There is only a forced stop, Miracatu, before leaving the BR-116: the House of fishing Serra, to reinforce the stock of jigs and lures. It’s worth the time. Iguape is a town of some 30,000 inhabitants, nestled in a landscape of estuary, to the edge of the short River Ribeira and the complex lagunal estuarine Iguape – Cananéia and Paranaguá, one of the largest nurseries of fish and crustaceans of the region, ideal for sport fishing both freshwater and saltwater. But the plan was to leave the waters of river and coastal sea and try with sporting species pelagic (offshore) without natural baits. Only lures and jigs. 26 feet of the hull of the Victory left the sweet waters of the river and hamacaron in a sea of ups and downs. Bow to the Southeast about 25 miles, to the first point to poll. Jigging was the chosen mode to begin with, originally artesanal-comercial fish much rooted in Japan. Forming team with Atsushi Yukawa, Jum Tabata and Diego Valsi, began acting in an area of about 40 meters deep. knock it off again to start over, looking for a Hunter fish attack it in that game of ups and downs. The sea which is homogeneous in appearance, hides accidents at the bottom or shipwrecks that are points of Congregation of small organisms and fish and after them come some major predators. GPS marked the exact location and the echo sounder showed the irregularity of the Fund and the presence of fish. 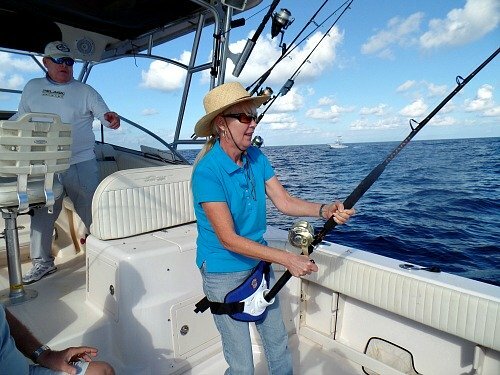 Climbs and fast descents on a jigging technique known as Japanese or speed, in which printed quick jerks with the stick while the reel is operated and recovers the jig aggressively, slicing through almost the entire column of water with the artificial. Varas in the order of 6 feet (1 foot: 0,3048 m) and good sensitivity – but with power – reserve are indicated (of good taper) to feel what happens below and have rest for a couple fight. The best reels are Rotary, but quietly front can be used. The requirement is to have brake quality and good ratio of recovery, at least 5 to 1 or more. Multifilament helps nail and feel what’s going down, although it should be the last meters – that border on the bottom and are subjected to chew – nylon monofilament or fluorocarbon of the 0.70. As we must not throw, knot of bonding between the two does not have as much demand as when practiced spinning or bait cast fishing lines joint with.